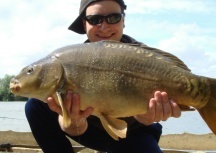 The carp in Oxlease are in beautiful condition, plus there are quite a few thirties available to catch. I'm not sure of the exact number, but I would state that I would have a better chance of catching a thirty at Oxlease than any other lake at the Linear fishing complex. The problem with Oxlease lake, as well as many of the lakes at Linear, is they tend to get very busy most of the time, even during the week! In fact, I find the only Linear lake with a decent choice of swims is Hardwick's and Smiths. However, I decided to fish Oxlease lake for 2 days. On my arrival at Linear Fisheries I drove around Oxlease lake to check out the pegs and try to locate any of the carp. After viewing many of the available pegs I returned to the main car park where I noticed fish jumping out in the first, right-hand peg near the notice board (peg 3). There was another angler fishing the peg to the right, and as I watched him cast, he was fishing at about 70 yards which was about 10 yards to the right of where fish were crashing out. I assumed the fish might be in and around his bait. I decided to fish the swim next to this guy ( Peg 3 ) as he had obviously done a good job of attracting the fish into his swim, and I could be crafty and take advantage of his good work. 12pm: Normally I use a marker rod set up before starting any fishing session, but as there was fish in the area I wanted to get the rods in first. I blasted in some of my fresh boilies (squid octopus) out at around 70 yards and slight to the left of where the carp crashed out. I didn't want to disturb the fish so I just used a throwing stick rather than spodding out, even though the guy to my right was using a spod. I felt that spod crashing into the water both sides of the fish might be too much and spook them away from the area. I set up the rods very quickly in order to try and get a rig out to the carp as soon as possible. I normally set up the bivvy first just in case it rains, but this time I thought sod it, even though it looked like it might rain. 12.30pm: By 12.30 all 3 rods were set up and I gently cast in the rigs after stick-throwing another 10 freebie boilies. This was done in ordre to move any carp away slightly before introducing a heavy lead into the water. I had opted for 3 different types of rigs on each rod, the main difference was the length of the hooklink and the material used. This means I could spread the the chances of having the correct fishing rig on, and whichever rig was the first to catch a carp, then I would change the other rigs to the same one. 1pm: More carp crashing out and now right in front of me, and on the area I was baiting. I sat there thinking I'd attracted the carp away from the guy in peg 4 and got them onto my bait - What a result! It was short lived though, as suddenly, I heard the scream of an alarm and seen the guy next to me pull into a fish. I watched him play it for about 20 minutes when eventually he landed a beautiful thirty pound mirror carp from Oxlease lake. I went over to look at the fish and what a beauty! It topped the scales at 31 pounds 8 ounces, well done that man! Typical for me though, I have now witnessed yet another thirty come out from the peg next to me. This has happened at many lakes over numerous years. Most of the time it has been a friend or family member and it does happen a lot to me. I always seem to be the one taking the pics, ah well, that's carp fishing! 2pm: The carp had now stopped crashing out, and I was wandering if I would even catch one the first day. It had even gone quiet for the lucky guy next door. But, at around 2.30pm I had a take. It shot across my swim and drove out into the vast water. I tried to slow the clutch gradually to help tire the fish faster but he was unstoppable. Eventually, I pulled him round and started to reel the line back. The fight continued for another few minutes and then just seemed to worn it out, within 5 minutes I had it in the net. It was a mirror of 15 pounds, not a great weight but a lovely Oxlease carp. See the photo above. 4pm: No more takes or carp jumping for over 2 hours. Maybe the fish had moved on. 6.30pm: With the time getting on, I was hoping the carp would return towards the end of the evening. I decided to set up the rigs and try something different. I placed one braided rig into a PVA bag and stuffed it full of high-betaine pellets. Maybe this is what was needed! By 7.30 I still hadn't had any action. 10pm: With still no signs of carp in the area I thought about moving round to the island pegs further up the lake on the opposite side. However, it was dark so I thought I'd hold out in peg 3 until the morning and move for the last day. As I was settling down for the night, the middle rod screamed off and I was in! This was the rig with sweetcorn on the hook, one of my favourite bait to fish for carp with. Again the fish kited to the left and ran for the middle of the lake. I could feel this was a much better fish, maybe my first oxlease twenty pounder! As I turned the fish it pulled to the right of my swim but the next peg was empty as the lucky guy had packed up and gone home earlier. After 20 minutes I managed to get the fish close in, desperately trying to get it to the surface so I could see what kind of carp it was and have a guess at the size. Eventually, I lost the fish about 2 rod-lengths out -no!!!!! 12am: I got the rigs all settled for the night. Two was on PVA bags now and one was to the right using a stringer tactic, and positioned close to where the other guy had been baited up earlier in the day. I could hear fish crashing again but this time it sounded much further out and possibly past the middle point of the lake. I felt it was too far to cast for me, so I left the rods in their positions and got my head down for the night. 3am: About 3.10am I was woken to another screaming run, this time on the right rod. This was the one close to the next peg and had a squid flavour boilie on the hook. I jumped out and pulled into the fish, I felt a huge surge of power as the fish took off for the distance. Unfortunately, within seconds of feeling the fish it pulled out and I had lost it. I felt disappointed as that could of easily been my first thirty at Oxlease linear lakes. 2 fish lost in one session, this was not good and maybe I needed to change something? 8am: With an early start, I decided to move to another peg. The pegs by the island looked like a good place when I viewed them yesterday, I only hope they are still available. 11am: I managed to get set up in peg 12. This was one right close to the island. All 3 rods was in the water by 11.30, I placed 2 rigs out close to the island, right next to an overhanging tree. The other rig was out by where I had seen a few bubbles coming up half-way out to the island. I tried my new fake weed rig to see if it would fool a good-sized carp into taking the pop-up that lays on the fake weed. I kept trickle feeding boilie chops on top of each rig in an attempt to attract carp onto my bait. 1pm: The fake weed rigged rod sprung into action as the rod tip bent round and the clutch started to spin quickly. I pulled into the fish and it was a lively one. Far too jerky to be anything big, but it was a take on my fake weed creation so a result for me! After ten minutes I landed another lovely mirror which hit the scales at 16 pounds. 5pm: With no more takes for several hours I decided to pack up. Oxlease lake is a fantastic place to catch a possible English thirty pound carp. The lake is often full, even during the week can be busy but with a little effort I think it's possible I'll have a thirty out some time this year, fingers crossed!